Crunchy, cheesy, sweet, and fulfilling! 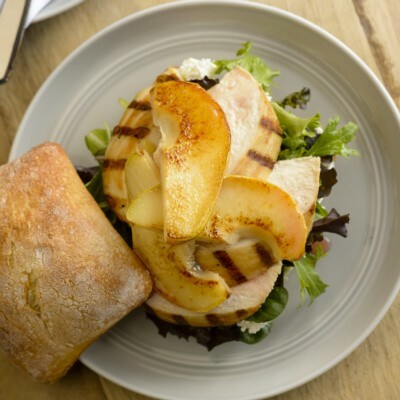 Try this delicious panini and you'll see that pears are a surprisingly tasty addition to sandwiches. This sandwich is also delicious with Gruyere cheese. Preheat a panini maker, grill pan, or griddle to medium-high heat. Place 2 slices of bread on a work surface and spread half of the mustard on each slice. Divide the ham between the 2 sandwiches and arrange on top. 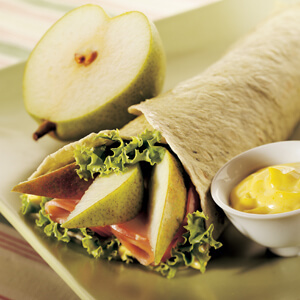 Add 3 slices of pear to each sandwich and grind a bit of pepper over the pear slices. Top the pears with slices of cheese. Place a slice of bread on top and butter the top slices of bread with half of the butter. If using a panini maker, butter both sides of the bread before grilling. Place the sandwiches in the panini maker and close the lid. Grill until nicely browned on both sides. For a grill or griddle, place the sandwiches buttered side down on the hot grill or griddle. Butter the topside of the sandwiches. Grill until nicely browned on one side and then flip and grill the other side. Cut each sandwich in half and serve immediately.